CJ CGV opened doors of city-type theme park called ‘V BUSTERS’, which is located in Yongsan, on the 18th. 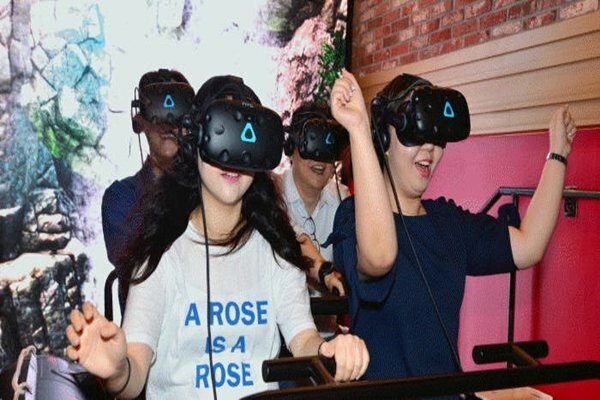 Along with opening of CGV Yongsan I’Park Mall, CJ CTV also introduced entertainment space that is filled with VR (Virtual Reality) rides and others and is planning to use these as business models for export. Its strategy is to supply VR entertainment according to how foreign movie theater companies are trying to develop movie theaters as cultureplex. V BUSTERS is an area where one can enjoy entertainments such as VR and virtual sports that are based on new technologies. V BUSTERS is equipped with 6 types of contents and 5 types of virtual sports and only takes $4.44 (5,000 KRW) per content. VR contents is divided into ‘attraction’, ‘interactive’, and ‘game’. At an ‘attraction’ section, one can enjoy ‘VR Hot-Air Balloon’ that allows one to enjoy view of New York while riding in a hot-air balloon and ‘VR Rafting’ that allows one to enjoy exploration of jungle while rafting. At an ‘interactive’ section, one can enjoy ‘VR Horror’ that allows one to find a destination with a flashlight and a car by using a simulator with a background of closed psychiatric ward and ‘VR Shooting’ that allows one to fight enemies in battles and occupy battlegrounds. At a ‘game’ section, one can enjoy ‘VR Mobile’ that allows one to enjoy cute character games while wearing a mobile HMD (Head Mount Display) and using a joystick and ‘VR Arcade’ that utilizes PC HMD. Besides these sections, V BUSTERS also operates sports zones for screen baseball (pitcher or batter), shooting, and archery and has entertainment contents such as ‘Drone Shooting’ that has a person shooting drones and dropping them. V BUSTERS operates from Monday to Sunday at 10 A.M. till 10 P.M.
CGV has worked with Barunson since end of last year and is operating ‘VR Park’ at CGV in Yongdeungpo that provides VR games. “Along with opening of CGV’s flagship branch in Yongsan, we are introducing VR BUSTERS that is an enhanced version of VR Park.” said a representative for CGV. CGV is planning to actively utilize entertainment areas such as VR BUSTERS not only for theaters in South Korea but also for theaters in foreign countries. By end of June, CGV had 139 theaters with 1,031 screens in South Korea and 262 theaters with 2,002 screens in foreign countries. On the opening day, Chairman Jung Mong-kyu of Hyundai Development Company visited V BUSTERS and showed interests while looking around V BUSTERS. CGV Yongsan I’Park Mall opened with 20 auditoriums with 3,888 seats. ‘4DX with ScreenX’ provides sense of immersion that cannot be seen at any other movie theaters with CGV’s own technologies. ‘IMAX Laser’ is the biggest IMAX auditorium out of all IMAX auditoriums owned by all multiplex in the world. CGV also added special concepts such as Salon S, Tempur Cinema, SKYBOX, and EGGBOX to each auditorium.